Michiel Knaven is a Dutch artist living in Zwolle, Netherlands with a web site at michaelmedia.org. He seems happy working with images, electronics, mechanical engineering, music, coding and so on. He's a also techie. He has been exhibiting works since 1993 so his education and early development occurred well before the Internet came into wide usage. But if somebody is an artist and a techie is it not natural and perhaps almost inevitable that such a person might want to produce web-art? One part of Michael's web site is quite special. 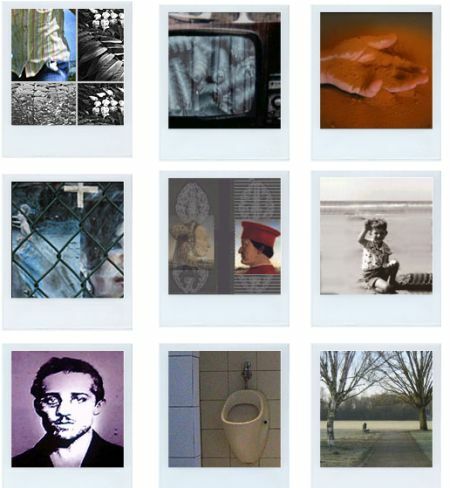 It is a web-art-portal with over a hundred links last updated in 2004. It lists many early web-art sites. If you want a good and quick overview of what web-artists were doing during the dot com boom Michel's *** Net Guide is a great place to start. The Museum Of Online Museums is portal to many web sites that are themselves museum or gallery web sites for collections of (sniff-sniff) old stuff. Often the main sites are quite well known. What is special is that MOOM takes you to a page on that site that you might not have yet considered visiting. For example the link for the New York Metropolitan Museum of Art goes to their fascinating Timeline of Art History. As you double-click around the site you end up in more out-of-the-way locations. A fun place to look around is in the Annex. Somehow in all of this, as you click back and forth between MOOM and other sites you begin to understand that you are wandering in a space or frame of reference that could occur only on the Internet. After a while, you may step back a bit and ask yourself "Where am I actually?" It turns out that MOOM is "edited by Coudal Partners, a design, advertising and interactive studio in Chicago, as an ongoing experiment in web publishing, design and commerce". As you begin exploring the other pages Coudal site, you will come across much more stuff that as a totality becomes web-art. For example Layer Tennis is a delightful mash up of graphic destruction design and crowd-sourcing. As we so often see, the web-art parts are portrayed as portfolio demos or presentations of skill sets. But deep down you can can hear, coming out from the web pages you are visiting, that primal scream: "I am an artist". What is the Art of the Net? What is Web-Art? It's on the Internet, doh! The work is digital. Sourced through Google, manipulated in PhotoShop, hosted on LAMP servers. It's the modern way of mixing pigments with oils and solvents and layering them on various media. It's the Art of This Century. Here's one dilemma: Do we let this art unroll quietly, un-self consciously? Or do we double-click on it for a closer inspection. How much will we change it by measuring it so early in its development? For example it does not deteriorate. In all likelihood digital works could last until the end of time. Unlike Leonardo's stalecoes frescoes. And innumerable paper works. The next part is starting to be interesting. It's interactive. The viewer owns the presentation. The viewer decides what is going to be seen and when and by which route. Compare this to boring contemporary videos where it is the artists that controls exactly what the viewer sees and for too how long. And then the new stuff is almost all open source. Being built on HTML, JPG image files and MP3 sounds, the tools to recreate the work are available to all who can view the work. Instead being locked up in a rich old fart's house, the work is as accessible to a youngster in a remote African village as it is the slickest silicon valley web guru. The work is accessible for many purposes not applicable to traditional art viewing, improving, scratching, embedding, whatever. And the freakiest thing of all: what benefits do ownership confer? If you own something everybody can access easily and for free, what is it that you really own? It is simply your pleasure to own it. Perhaps it's not about ownership it may be more like a marriage. You and this work are in partnership. You put a work of art on the web and its reward to you is the number of visitors that to whom it gives pleasure. One of the great sites for art on the Internet is deviantART.com. In operation since 2000, the site provides free access to over 41 million works of art. In comparison the New York Metropolitan Museum of Art which started in 1870 has a collection of just over two million works. 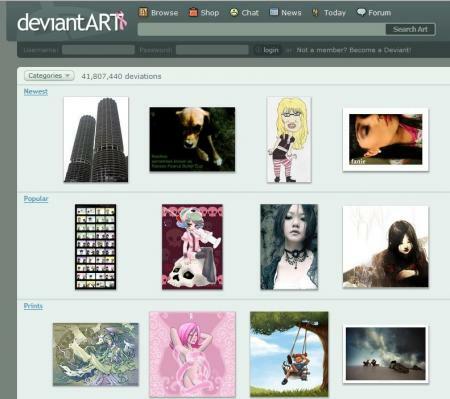 deviantART hosts works that are drawings and paintings either scanned or digital, comics, photography (motion and still). The web site enables artists to display, sell, discuss and comment on a wide variety of styles and media. It's well organized, easy to use and well-loved by its many members - over thirty-five thousand were on when I looked. how about group architecture - everybody in sketch up - has their own block or room? Utilize the wisdom of crowds? ?